You know you've arrived when you get a dedicated button on someone else's remote control. That's what's just started happening to Netflix in the UK but it's something US companies have been doing since 2011. Netflix announced at CES that it would be backing certain TVs that gave a good Netflix experience with its "recommended TV programme". 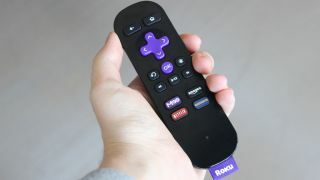 In order to be part of that TV manufacturers will need to have a certainly quality of experience to take part, including a dedicated button and fast startup times for the app. Panasonic, Philips and Sony are all participating in the initial run of sets that feature the dedicated button. Interestingly, nothing is mentioned about LG, which was a key partner with Netflix at CES this year, with the company being involved in the roll-out of HDR video to TVs this year. It's clear that Netflix is stepping up its game in 2015. A long-awaited Australian launch will happen in the next few weeks and as we reported yesterday, Netflix wants to abolish the idea of one country being able to see video before another. Along with all that, the company is pushing for net neutrality in the US and making it clear that it's going after broadcast networks. This month, Netflix will introduce its new original TV series Daredevil following on from the success of Unbreakable Kimmy Schmidt in March and, of course, the recent return of its mega-hit House of Cards.